The fact is, neither the inventors of the Internet nor Al Gore could have seen any of this coming. The Domain Name System of the Internet was not designed for a world where not just every commercial enterprise – but also every small business, organization and millions of individuals – required their own online location. According to global registry operator Verisign, at the end of 2014 there were 288 million total domain names registered. And this isn’t nearly enough, as growth in the number of registered names, quite predictably, is increasing. While there’s technically no worry of the Internet ever running out of available names, there are considerable pressures in play when it comes to controlling the relatively few good ones. If brevity is beautiful, it also is fleeting, as the Internet ran out of three-character .com domains in 1997. By 2013 the well ran empty of available four-letter .com domain names, with all 456,976 of them taken (though you can still find four-character domains, such as those including a dash). The lowercase nature of Web addresses as displayed in browsers and the lack of spacing both create issues as well – you may visit “expertsexchange.com,” and the Experts Exchange may or may not be what you expected. SEO is a huge concern for businesses and entrepreneurs when choosing a domain name, especially as search engines like Google have developed more nuanced capabilities for determining how well domain names match the content of their sites, reportedly granting preference to sites where the name and content are well aligned. 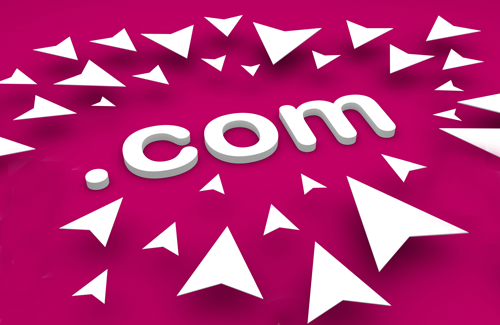 Simultaneously, it’s become common for individuals to buy domain names for personal use. If you have a more widely used name like James Smith, you may be toward the end of the line as far as what domains are still available for you. There are resources to assist you creatively in locating a piece of fresh online real estate still available for you to register, though. Domainr.com lets you type in keywords and suggests appropriate domain names from all of those available. You can then use Knowem.com to view the availability of your potential domain name across all popular social media networks, in order to determine if the name will work well as your handle throughout the Internet. If you find your options exhausted, you might try your hand at the auction house. In the interest of gaining a sensible domain name for your business or personal project without resorting to cumbersome length or confusing dashes, you may need to pay more than the basic registration fee and purchasing it off of someone else. Buying domain names for resale as an investment is completely legal and even encouraged on Verisign’s site along with a guide to “domain investing.” Among the great tales of domain speculation, investor Mike Mann registered 14,962 domains in a single day in April 2012, and went on to make $400,000 a month selling them. For your auction activity, it’s wise to determine the cost threshold for which you can reasonably expect a return on your investment (cautionary tale: several sites that have sold for millions are defunct today). There’s also the possible scenario where you may have a legitimate claim to a domain name if you hold a trademark for the term (and can show that the owner only registered it to exploit you). You’ve probably heard of it - it’s called cybersquatting. Does “MikeRoweSoft.com” count as Cybersquatting if your name is Mike Rowe? Cybersquatting – e.g. registering a domain name in bad faith in order to benefit financially either by exploiting someone else’s trademark or selling the domain to that person at a ridiculous charge – is actually illegal. And like so many sections of the law, it’s riddled with gray areas and fascinating cases. Certainly one of those is Microsoft vs. MikeRoweSoft, a 2004 case where a Canadian high school student named Mike Rowe registered MikeRoweSoft.com as the site for his small, part-time Web design business. Microsoft initiated legal measures and, eventually, a cease and desist order to protect the computing behemoth’s trademark. Eventually the parties reached an agreement where Mike Rowe moved on to another domain and Microsoft provided him a package that included a trip to a Microsoft event, software, training for Microsoft certification and an Xbox with games. And before you blame Microsoft for over-aggressiveness in this case, you may take a look at trademark law instead - many experts believe that if Microsoft had knowingly ignored Mike Rowe’s site, it could have jeopardized the company’s right to challenge other infringements on their trademark. Once you do have a domain associated with you, it’s wise to hold on to it – or at least to make sure any lingering association you have won’t lead to embarrassment. Heinz recently learned this the hard way: a domain formerly linked to by a QR code on their ketchup bottles was, for the purposes of a contest, bought by another party. The contest is over, but ketchup lovers who scan those QR codes now win a quick trip to a site with very adult content. The lesson here is that names are important, valuable and there aren’t enough good ones to go around (though new gTLDs certainly will help). Take care in finding your online domain, and may your name be respectable, affordable and memorable for the right reasons. Get started buying and selling domains by purchasing your copy of Website Magazine's Domains 360 book today!